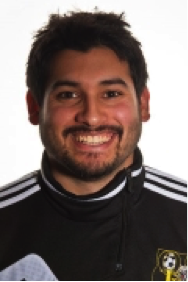 Shane Bufano is the founder and current Director of Coaching for Queen City FC. Bufano started the club in 2011 and since then has developed the club from its original three teams to its current membership of 20-plus teams and over 300-plus youth players from U-8 to U-19 (Boys and Girls). Currently the Head Men’s Soccer Coach at Northern Vermont University Johnson, Bufano has earned numerous accolades in his coaching career for his work with Queen City FC, including two of the Vermont State Soccer Association’s highest honors: the 2016 VSA Administrator of the Year and 2013 VSA Girls Coach of the Year. Bufano has made a mark at NVU Johnson as he continued building off a strong first campaign with an even better season in 2018. The program reached some new heights since joining the NCAA as it surpassed the single season win mark by two games with a 10-win season. The team also set single season program records for Goals (45), Points (127), and Assists (37). The Badgers also reached the postseason for the first time since 2010, and earned the #4 seed in the North Atlantic Conference playoffs as a home playoff team which last happened in 2007. In addition, 3 players were selected for the NAC All-Conference teams with Rob Buonanno and Daniel Arriola as First Team selections, and John Folsom as a Second Team selection. Rob Buonanno ended the season leading the NAC in Goals (12) and Points (28), while 3 players were in the NAC's Top 5 in Points (Buonanno 1st, Arriola T-5, Salgado T-5). Additionally, 5 players were ranked in the top 5 in the NAC for Assists (Hanna - 3, Buonanno T-5, Arriola T-5, Holloway T-5, Croteau T-5) and Tristan Salgado joined Buonanno in the Top 5 for goals in 5th with 9 goals scored. During the season, 3 players were also selected as NAC Players of the Week (Joe Holloway, Rob Buonanno, and Daniel Arriola), while Arthur Clayton was selected as Defensive Player of the Week, and Tristan Salgado as Rookie of the Week. Buonanno was also selected as the HEROSports D3 Player of the Week for the week of October 21, 2018. Bufano had a strong first season in 2017 as he was able to solidify the Badger roster to 25 players and guide the team to one of the best seasons in the past decade. The Badgers had a 5 win turnaround which was top 15 in NCAA DIII, while posting 7 wins (1 shy of a school record in the NCAA Era). The Badgers also set a record for most goals scored in a season in the NCAA Era with 43 in 2017. The team also improved a spot in the NAC Conference from the previous year. 3 Badgers earned conference awards with Dominic Caforia being selected the second team all-NAC, while Joe Holloway was selected NAC Rookie of the Week and Jarod Croteau was named to the All-Sportsmanship team. Prior to NVU Johnson, Bufano served as an assistant women’s soccer coach at Saint Michael’s College for two seasons under Wendy Elles, and was a boys assistant soccer coach at South Burlington High School for five seasons, where he helped South Burlington reach three Vermont Division 1 State Championship games, winning two titles (2011, 2014). In addition to his DOC duties, Bufano has coached a variety of teams throughout Queen City FC, both male and female, from U-10 to U-19. He has guided his teams to several club tournament finals and championships at various levels. As a player, Bufano earned several accolades as a forward for Green Mountain College. He was a two-time All-Conference selection in 2005 and 2006 in the Association of D3 Independents Conference (AD3I). In addition, he was the runner up for Rookie of the Year in the AD3I Conference in 2005 after scoring 16 goals during his first campaign for the Eagles. Bufano led the team in scoring and points in 2005 and 2006, and over three seasons finished with 24 goals and 8 assists after a knee injury cut his final season short in 2007. Bufano holds the NCAA Division III record for goals per game among institutions classifying to Division III, and is the Eagles’ Division III era leader in all-time goals and points, while also being the single-season leader in goals. He ranks in the top five all time in 13 different statistical categories. While at Green Mountain, Bufano also was a captain of the Varsity Tennis team and earned the GMC Scholar Athlete and Coaches Award (2007). Prior to Green Mountain, Bufano played at Champlain Valley Union High School in Hinesburg, VT where he was a part of the 2002 and 2003 Vermont state championship teams. He also played several years with Nordic Soccer Club, and was a member of Vermont ODP for three seasons. Bufano holds several coaching certifications such as: the United Soccer Coaches (USC) Advanced National Diploma, USC Director of Coaching Diploma, USC Goalkeeping Diploma, USC Futsal Level I License, and United State Soccer Federation (USSF) "D" License.